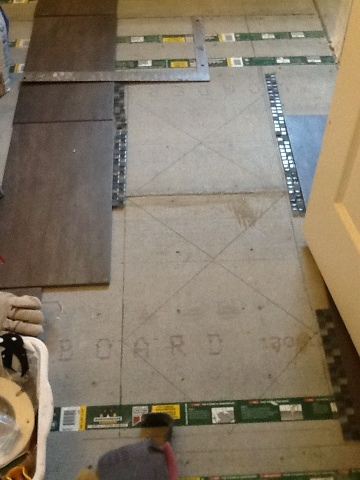 Cutting tiles for the bathroom floor | ARTZCOOL'S BLOG! When I first started planning the bathroom, I had a picture in my mind of the floor, and although I have changed my mind numerous times about the vanities, the countertops, the paint colour, and so on, I haven’t changed my mind about the floor. So, it was about 2:30 today that I actually started cutting! I won’t go into too much detail about cutting tiles, but here are a few tips. The middle part, where the tiles were on a diagonal was actually pretty easy… No measuring, just cutting in half diagonally. The tricky parts are around the door frames and the corners. I have tried using a measuring tape, measuring the floor then marking the tile, but I always end up having to recut because I messed something up. Here is my method for making a good cut. Using a stiff paper, cut out a square or rectangle the exact same size as your tiles. 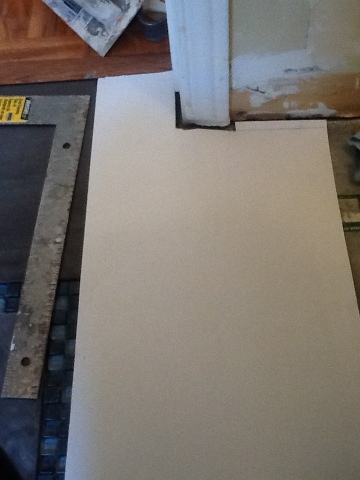 Then, place the surrounding tiles on the floor and lay the paper where you need the tile cut. 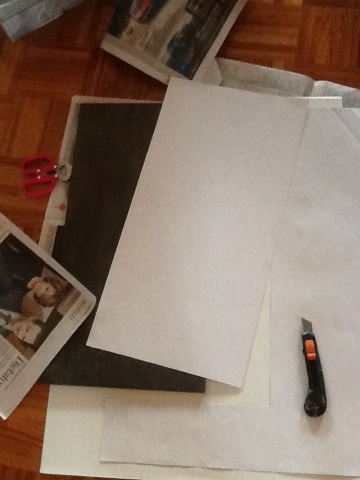 Cut and fold the paper to the correct shape and size. Then all you have to do is put your template on a tile and trace around the edges. When you are cutting, remember that you have to cut off your lines (or inside the lines) because tracing around from a template make you lines a little larger. To cut curves or inside corners is the most challenging part. 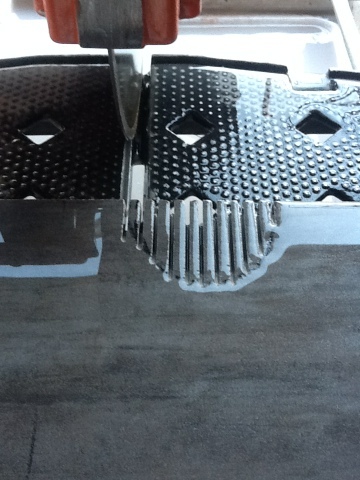 You have to first draw on your tile where you want it cut. 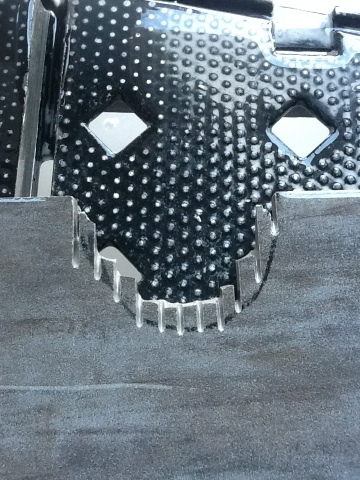 Then cut a series of cuts ending at the line you have drawn. 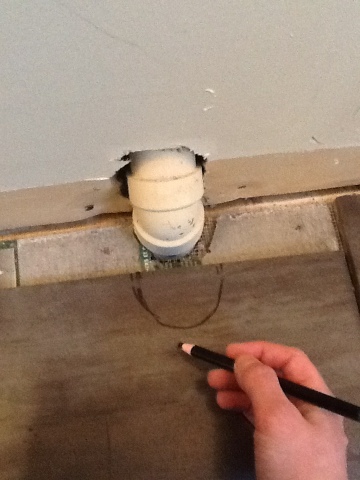 Snap off the strips of tile using a pair of pliers, or tap them with a hammer. Then you have to go back to the saw and use the side of the blade to almost shave off the excess bits. 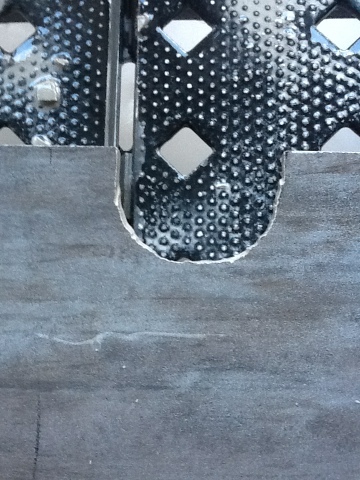 You will also have to lift your tile up to the saw on an angle, and even turn it upside down to trim off the excess because of the curve of the blade. Here is the curve, I might go back and clean it up a little more…but it is actually going to be behind, or under the vanity, so I will probably just leave it..
FYI, I would normally actually lay the tiles as I was cutting, but i didn’t this time for a few reasons. First, because this space is so small, and second, because I have marked out the tiles for the center piece so carefully, and third because the outside tiles are so large. So the next few steps are adhering the tiles to the floor, removing the mirror, grouting, painting, and installing the new vanities. What I have to figure out is the order… Which one do I do next? 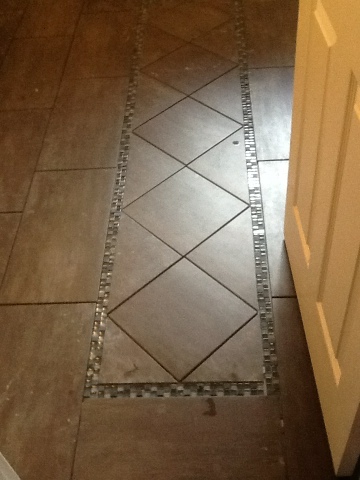 I wish I knew how to cut a circle in tile better because every time I have tried, it destroys the tile. Keep up the great posts.